When I started this blog some 4 years back, I couldn't imagine myself eating egg even slightly underdone. I have written a whole post on it, and here we are today, I love to eat my eggs under done specially if they are fried, poached or baked. Except for of course this egg curry which is a staple in my house requiring hard boiled eggs. Another food I have been averse to is refried beans mostly because I always ended up trying them from a can and the awful texture and smell put me off even before trying it. Four years since and to say this refried bean inspired baked egg where the yolks are best kept oozy, is a family favourite just reminds me why I love coming back to blogging. After reading this post by Heidi of 101cookbooks on maintaining a long term blog, it got me into thinking why I blog. I have been (in internet terms) been blogging and maintaining this blog for a long time despite it being very different from how Heidi does or the scale of it for that matter! Heidi, of course is an authority on blogging, one of the oldest food bloggers that all food bloggers look up to without a doubt. I remember once she added my how to make paneer post on her favourite list and I must have smiled in my sleep that night! Heidi is just been doing what she loves, every single week, passionately. There is no hypocrisy in her food and lifestyle. She might as well use all purpose flour when it has to be used. I like her. I just wanted to touch upon how you can blog and be relatively successful at it in more than one ways (which Heidi already covers beautifully in the post). I like to blog (even if scarcely), to be able to write down the stories of my childhood or family that otherwise might be lost in the busier, crazier life we lead everyday. There needs to be a place I can share them, along with the recipes that are inspired by it. I have never, never given myself a schedule to blog by. True, when I blog regularly I get way better viewership but that has never inspired me to cook or blog. It doesn't challenge me. I don't want blog to be work that I have to do every week. For me creativity doesn't flow in that manner. I blog to inspire myself more than others. There are readers you loose along the way when you decide you don't want to cook, blog or connect in a way that pleases the masses. But then you also gain, long term readers, who continue to read what little you have to say even if it is after months. It is that small community that I value the most. And for me, that's success. I knew when 2014 was starting that it's going to be a great year and it absolutely has been one of my best years. And that I have been inspired and kept blogging is one of the many reasons why. I hope you shall find inspiration in blogging too as I have. Hope you been keeping warm! This recipe might be perfect for these chilly days. You could in a pinch use store bought harissa which can be spicier depending on the brand so start with 2 tsp - 3 tsp just in case. This makes a great brunch dish, which is what we usually do on weekend but is also as good for lunch or dinner. I have used chickpeas once for this recipe and it tasted great except it's tad bit heavier. *This recipe makes slightly more than 4 tsp but we like ours spicier so we use it all! Mix the ingredients for harissa and make a paste. Heat oil in an oven proof pan (preferably cast iron skillet), add the chopped tomatoes and let them mash down and then add harissa and salt. Add the beans, mix well. Create four holes in the pan and crack and egg into each. Season with salt and pepper and put in 180 C for 10 minutes until eggs are firm but yolk runny. Garnish with chopped spring onions and sumac. Serve with butter toasted sliced bread to scoop up. A beautiful post. This dish looks simply fantastic! This is positively stunning. Love the recipe! 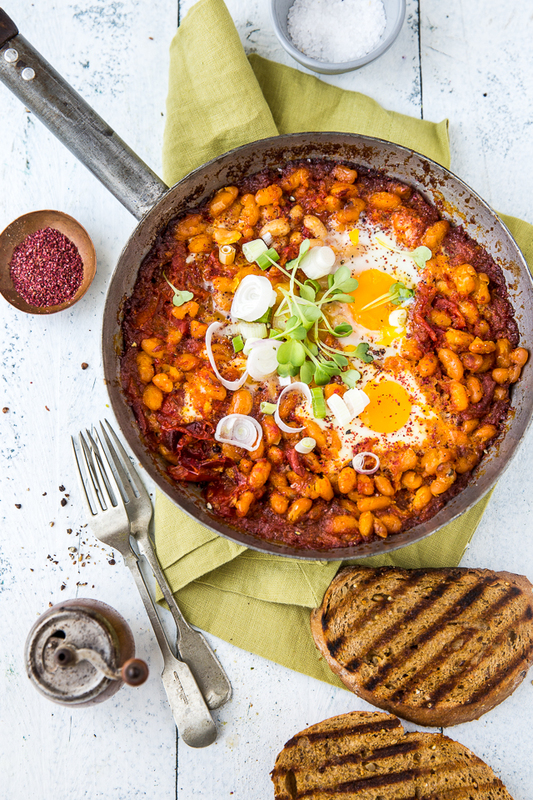 I never would've thought to combine beans and eggs before seeing this, and now, it's all I want :) And for what it's worth, I'll keep reading regardless of how often you blog! I have always wanted to try Harissa and this also gives me a great excuse to finally go to our local specialty grocery store for the first time. Can't wait to try this yummy looking dish!